The blog was very pleased to see the Nobel Prize awarded jointly to Robert Shiller, whose words of wisdom on housing and stock markets it has cited many times. Or to use the phrase of JM Keynes, “the market can stay irrational longer than you can remain solvent”. More recently, of course, staying solvent has become ever-more difficult for investors who focus on the fundamentals of supply and demand. They are out-gunned by the high-frequency traders (HFT), who now dominate trading in most major financial markets. These trade millions of shares in a millisecond, and make their money due to the low interest rates provided by the US Federal Reserve and ultra-low trading costs from the exchanges. How come we have allowed a situation to develop where the tail wags the dog? Data is fed automatically into algorithmic models without any censorship and machines then spit out huge volumes of buy and sell orders. Why is this possible? Because the buy and sell orders feed automatically into an electronic trading venue without any human intervention. Anybody who argues that electronic trading has moderated rather than increased price volatility is smoking dope. What they have done is create easy (but not equal) access and enabled a huge increase in volume. Hallelujah! But be careful not to ask too many questions about the quality of the prices and increased liquidity implied? The chart above shows HFT’s latest “success”. Last Thursday, the world knew that talks were to take place at the White House on the debt/default issue. But the machines only found out as they scanned the morning news reports. 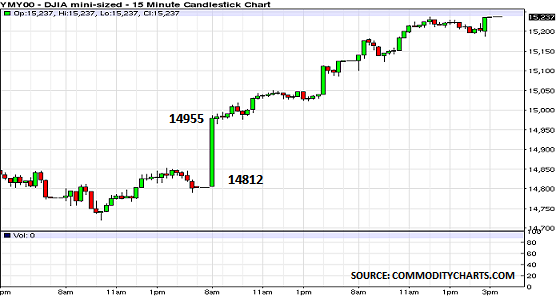 So in 5 minutes, they traded the Dow Jones Index up 1% (143 points). And the size of the green bars shows how they kept prices moving upwards for the rest of the day. In turn, of course, other markets followed their lead. WTI crude oil jumped 1.1% ($1.11/bbl) as the correlation trade worked its magic. Yet nothing actually happened in terms of supply/demand to justify this move. A few regulators, such as Andy Haldane at the Bank of England, are pushing for change. But all the time the risks are rising. HFT’s dominance means no single market now knows what it is pricing. Repricing could therefore be quite dramatic, when the fundamentals of supply/demand once again become key to price discovery.